Signs of autumn are already appearing. The mornings the past few days have been foggy, cloudy and cold. It doesn't actually clear up until late afternoon. 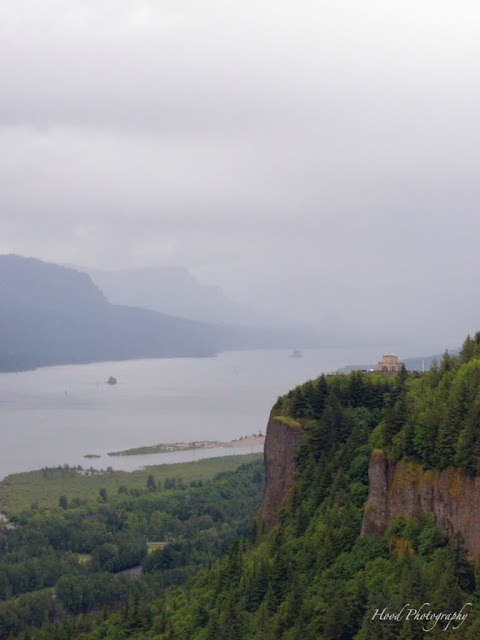 Away from the damp Columbia River Gorge (pictured), things are looking dry. Yesterday, I heard geese flying over my work. I am hoping this is just a short phase though. We were so cheated out of summer here in the pacific northwest. We deserve at least another month of good, warm summer weather! We have been having heavy rainfall here and waiting for some warm sunshine too!! Aww hope you see better days before Winter sets in!! I love the photo. Autumn is slowly coming here as well and like you, I would have liked a bit more summer. But autumn is my favourite season and I'm looking forward to it. We spent many vacations around the Gloomy Gorge. It is beautiful in its own way but I sure like summer sunshine here in the Sacramento Valley. I love the name "Gloomy Gorge" for the Columbia River valley. Beautiful photo illustrating its often-gloomy nature. A gorgeous gloomy gorge! What's that on the top of the cliff? Looks beautiful as well. I'm so sorry you were cheated this year! I hope you have a beautiful fall! Beautiful photo! The one and only time I was in this area it looked just like this w/ the same weather. The gloomy weather sure made this a fantastic shot! It reminds me of parts of the Rhein River in Germany. I'll send you some of our sunshine! A dramatic photo of the gorge. A beautiful portrayal of the gorge. They say we may have a nice September. My fingers are crossed. Must be a beautiful place when the sun shines !